Android’s growing popularity in Asia, particularly in Japan and South Korea, has helped Google’s Play store for Android record a revenue jump of 67 percent over the past six months. 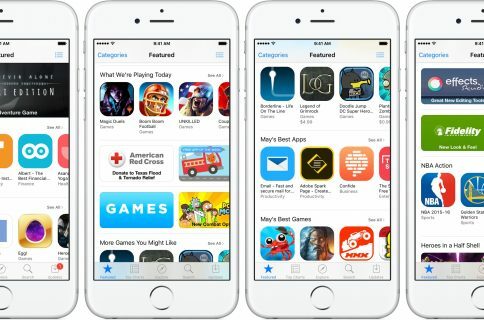 By comparison, Apple’s App store revenue has climbed just fifteen percent during the same timeframe, according to analytics firm Distimo. 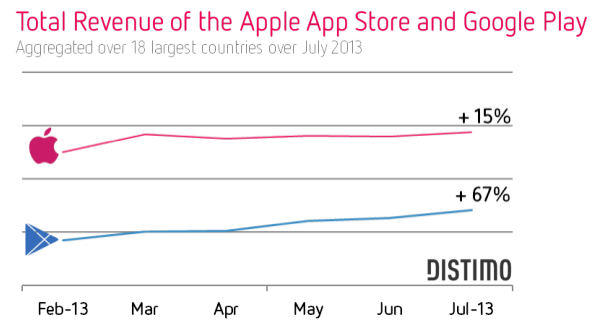 Of course, Distimo’s numbers span six months, while App Annie’s covered just three months. 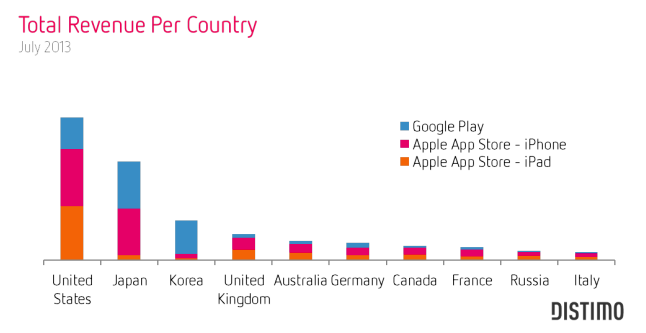 In terms of which countries spend the most on apps, the U.S. remains the leader. However, No. 2 Japan and No. 3 South Korea comprise the bulk of Google Play revenue, according to Distimo. The remainder of the top 10 countries: UK, Australia, Germany, Canada, France, Russia (which spends more for iPad apps than iPhone titles) and Italy. 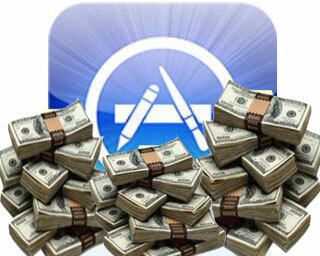 When it comes to categories of paid apps, Apple’s App Store is heavily games. Google’s Play store on the other hand is led both by both games and utilities. The influence by Japan and South Korea is evident in some of the apps on Google Play holding four of the top 5 apps. For instance, following No. 1 Candy Crush Saga is Japan’s Puzzles & Dragons. South Korea’s Kakao hold No. 3 and No. 5, intermingling with Google Play’s No. 4 paid app, LINE from Japan. There’s no denying that install base matters and in this regard the numbers favor Android. 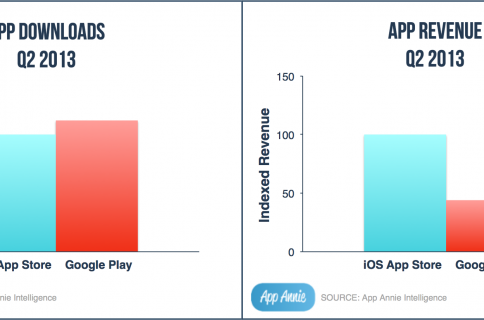 As Benedict Evans puts it, due to its 2-3 times larger install base Google’s Play store may surpass Apple’s App Store in terms of revenue in 2014.